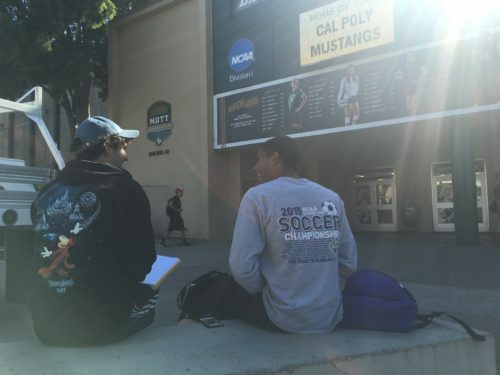 The enthusiasm and excitement starts up around this time every year at both Cal Poly and UC Santa Barbara because students and players are getting ready for the Blue-Green Rivalry game. Both teams met on the field in 1921, but the Blue-Green Rivalry officially started in 1994 and blew up in 2007. The rivalry encompasses all ten sports, but men’s soccer still continues to be the most popular because of the high attendance and sold out games. This upcoming Saturday, Oct. 28 in Alex G. Spanos Stadium the two teams will face off once again for yet another nail bitting match. With the game coming up, my team decided to dive into the history of this rivalry and get an insight into the build up of this game. 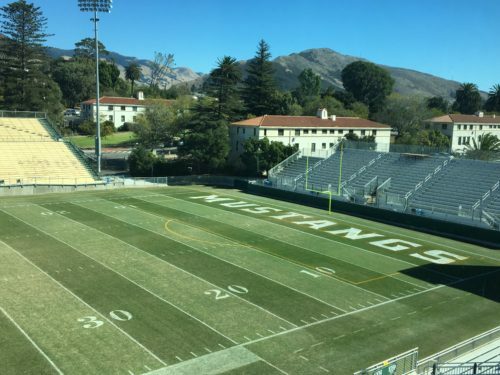 View from the press box at the Alex G. Spanos Stadium at Cal Poly where many Blue-Green Rivalry games have been played. The first interview we had was with a former player, Trenton Matson. Matson was born and raised in Walnut Creek and a big reason that he decided to come to Cal Poly and play soccer was because of the Blue-Green Rivalry. We met with Matson in front of the Mott Gym and Navid Golemohammadi, our lead writer, conducted the interview. He came prepared with questions and recorded the interview on his phone so that he could go back and pull quotes for the article. Golemohammadi interviewing Matson in front of the Mott Gym. The second person we were able to meet with was the Assistant Director of Athletics Communications, Chris Giovanni. 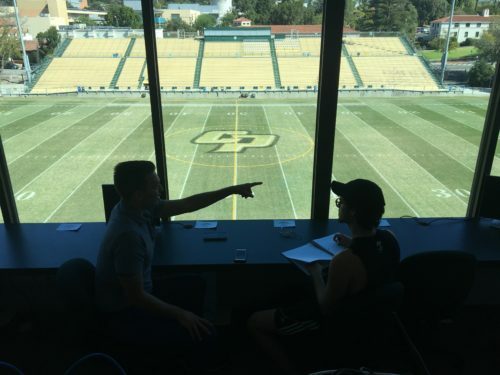 He decided to meet us in the press box at the Spanos Stadium to tell us about his experience of watching Cal Poly soccer evolve since 2016. 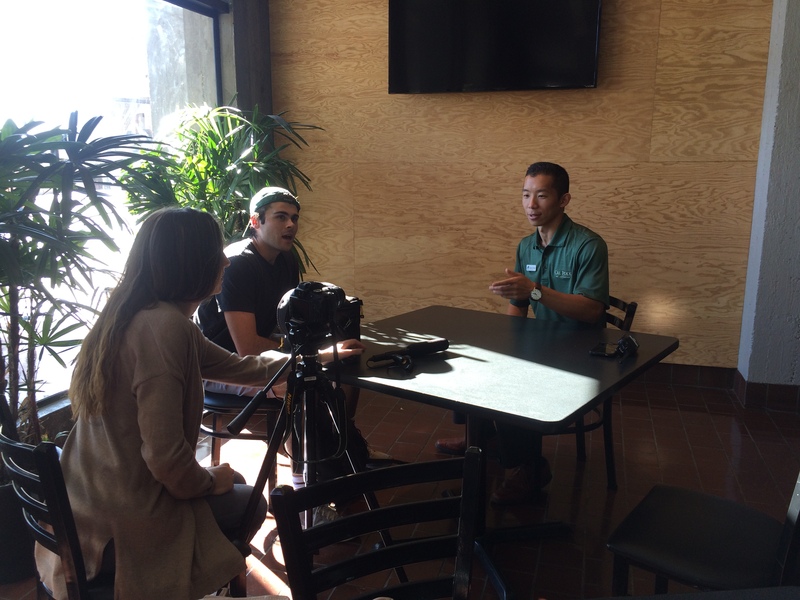 Giovanni reminisces on some of the most significant moments as in “2008 when Cal Poly sold out for the very first time.” Once again, Golemohammadi led the interview and Reilly Roberts, the interactive lead, took pictures of behind the scenes. Giovanni and Golemohammadi talking at the press box of the Alex G. Spanos Stadium. Our interactive chair, Reilly Roberts, decided to tackle the data portion by creating graphs and charts to complement the article. “With lots of record breaking numbers within the Blue-Green Rivalry’s history, it was exciting to put all the numbers together and visually see what an impact the game has,” Roberts explains. After getting a variety of perspectives from different people and collecting past information and facts, my group was able to put together a story that gives a better insight into the Blue-Green Rivalry. Golemohammadi realizes after interviewing various of people related to the rivalry that “the reasons for its birth can’t be pointed to on element alone.” Between the video, interactive data and information gathered to write the article, it has turned out to be a successful story that is relevant during this time. As of January 1, 2017, California law AB 1887 prohibits the use of state funds for travel to states whose laws discriminate against the LGBTQ+ community. What does this mean for Cal Poly students? CSU staff, faculty and students are unable to attend some events and conferences that would otherwise have been paid for by the CSU system. Our story choice primarily came from our group members being personally affected by these restrictions. One morning, two of our group members who work for Mustang News overheard General Manager Paul Bittick speaking about the organization’s inability to attend the National College Media Convention in Dallas, TX. “Every state has the right to make laws whether we agree with them or not. At the same time, we need to obey those laws and you can fight to change those laws. I just think it’s not right to create a law that limits some of the learning opportunities for students,” Bittick said. While Mustang News employees were able to attend this conference in the past, this year the organization will have to pass due to the travel restrictions set forth by the state of California. 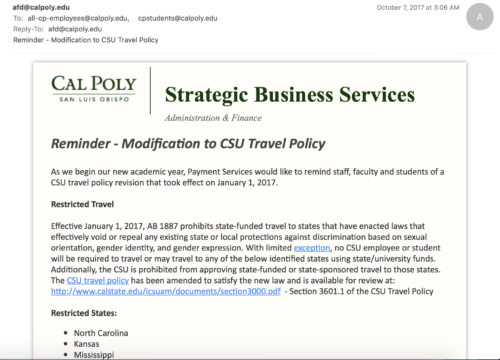 Coincidentally, Cal Poly students including ourselves received an email reminding us of revisions to the CSU Travel Policy only one week after beginning our project. 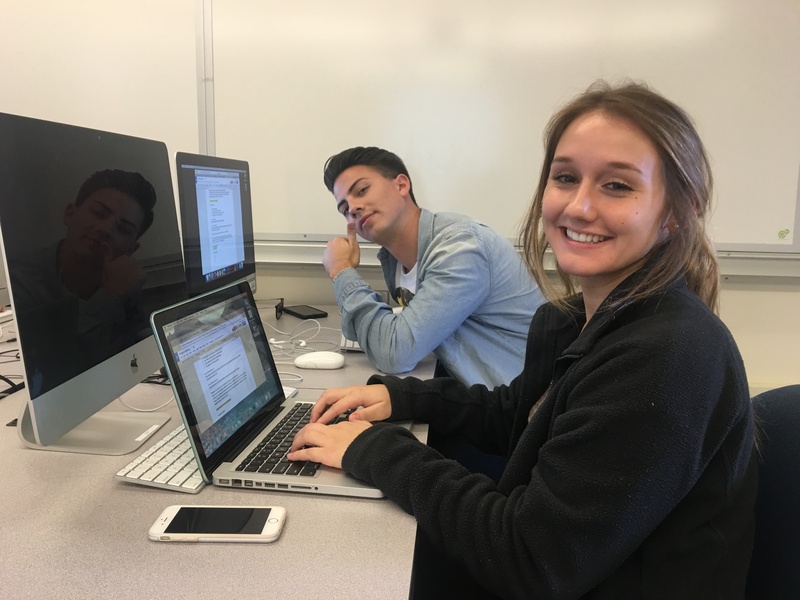 Nikki, the writer of this story, reached out to Cal Poly’s Queer Student Union, various clubs and organizations affected and the CSU administration to get their perspectives on this topic. 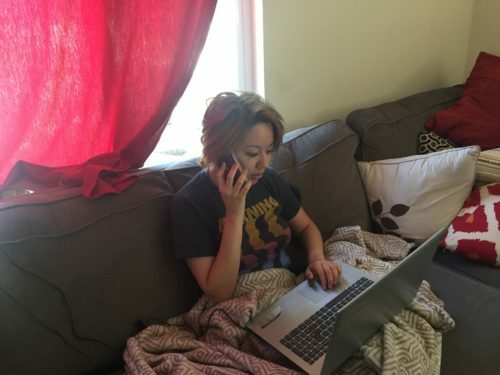 She interviewed multiple sources while also taking into account the impact this has on the LGBTQ community. “I wanted to focus on what’s being done about this currently. We all know the travel policy is in place, but is it working? Is this changing attitudes towards the LGBTQ community? I did not want to forget those voices, or for them to get swept under the rug just because this inconveniences everyone,” Nikki said. Hannah compiled a list of clubs that had somehow been affected by the restrictions. She created a web-like infographic that shows some branches of clubs as well as each club that we were able to get in contact with. In addition, she created a short info video that can be posted on social media to inform viewers of the new travel restrictions that were put in place. 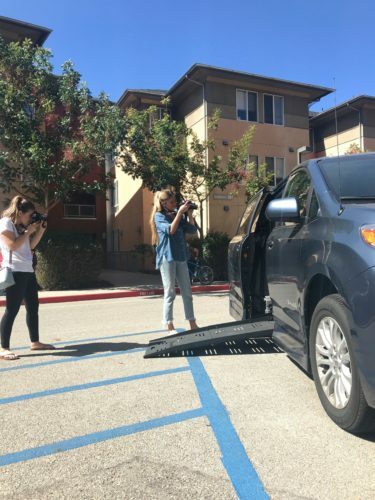 Hayley reached out to Cal Poly students and parents on Facebook to receive input, and got responses from a few clubs that had been affected by AB 1887. These clubs were also implemented into Hannah’s infographic. 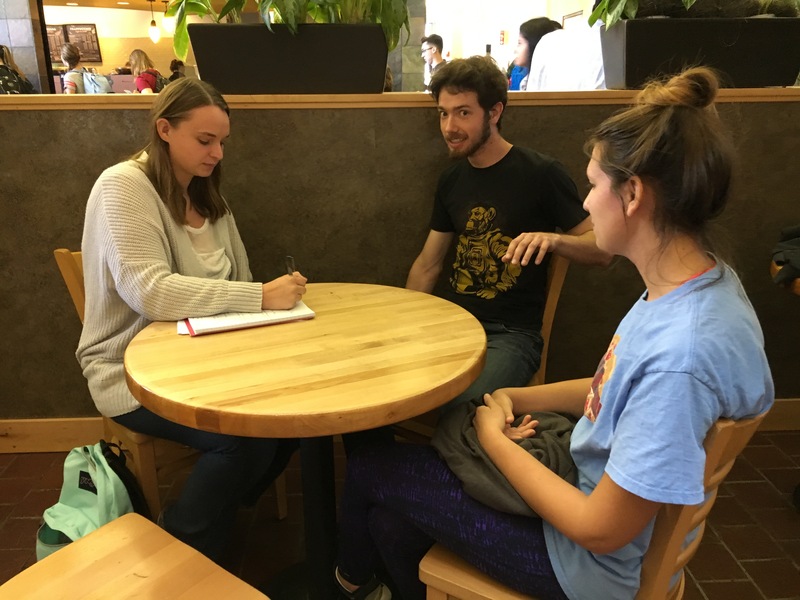 “It was really interesting to see how many students have been affected by this law. 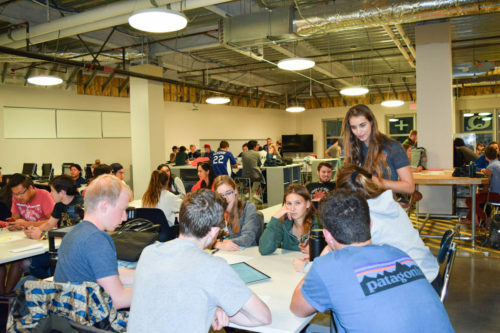 We only got in contact with a few sources, but the responses would be endless if we had time to reach out to every on-campus organization,” Hayley said. One was Society of Women Engineers who would have been unable to attend the National SWE Conference in Austin, TX if they hadn’t submitted their paperwork before the new states, including Texas, were added. Cal Poly’s Triathlon Team found a loophole in the system and plan on flying into Georgia for USA Triathlon Collegiate Club Nationals in Tuscaloosa, AL. They are finding ways around paying for a hotel so that their funding for housing does not pay the state of Alabama by hotel fees. 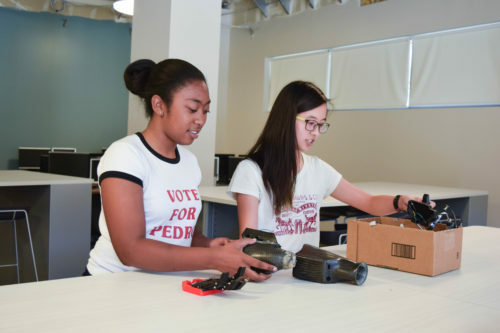 A student in Cal Poly’s club WISH (Women Involved in Software and Hardware) also reached out, saying she may be unable to attend the Grace Hopper Celebration in Houston, TX next year. Within our time frame, we reached out to multiple students and faculty who will be directly affected by this law, proving this story to be timely. At our first pitch meeting of senior project, we began sharing story ideas tentatively. We bounced around a couple ideas: A 24 hour look at SLO Do Co? Investigating the “creeping” that’s been going on near campus? 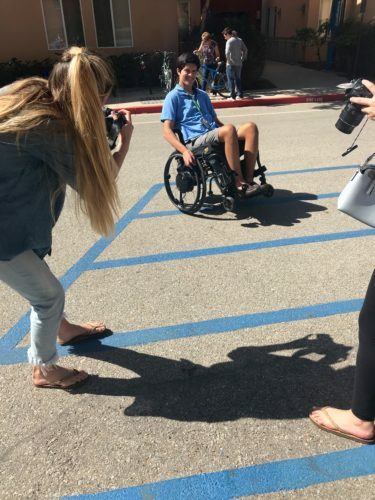 Then, we hit a gold mine story: Ysabel suggested the idea of doing a profile on Jake Javier, a Cal Poly student from her hometown who suffered a life-altering accident his senior year of high school, leaving him paralyzed from the chest down. After doing preliminary research, it became clear that Jake’s story was covered extensively by local and state papers at the time of his accident. We were all amazed by the tenacity and hopefulness Jake maintained through his long recovery process illustrated in the articles we read. We grew excited to meet him and hear his perspective on the accident first hand. On Thursday, Ysabel and I were first able to meet up with Jake to discuss his availability and our intentions for the project. We lucked out – Jake was the perfect subject for a story: he was charming, chatty and very willing to explain the details of his injury and how he lives his life. Without hesitation he said he’d be willing to speak on all topics of his accident, and we decided to meet on Sunday at his apartment in Cerro Vista. 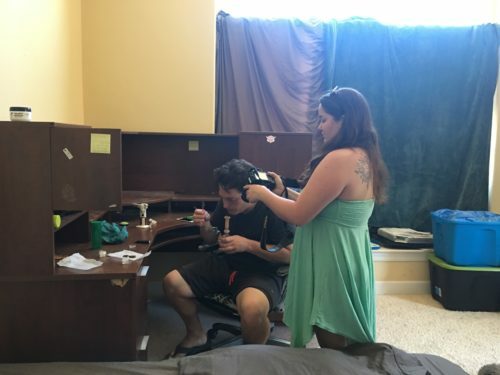 On Sunday, Jake was very comfortable answering all our questions, despite having a four person journalism team crammed into his apartment peering at his things, scribbling notes and taking pictures. “Jake goofs around a lot and was super outgoing and very easy to talk to. He’s very comfortable in his own skin,” said Jody. This made the interviewing process much easier on our part. We toured his tiny apartment, checked out some of the equipment he uses for physical therapy, got to see his car and then walked outside to interview him and get some video footage. In between takes, our conversations were light and friendly. Jake had a great sense of humor and an extraverted nature that made us giggle and put everyone at ease. His perspective on being in a wheelchair was very positive. He explained how patience and his stubbornness are keys to his success: “Things take a while and things take a lot of effort, so I have to be ready to push through a lot of challenges,” said Javier. Jake and Ysabel chatting during our first video interview. One obstacle we ran into early on was making sure we were being as sensitive as possible towards Jake’s situation. 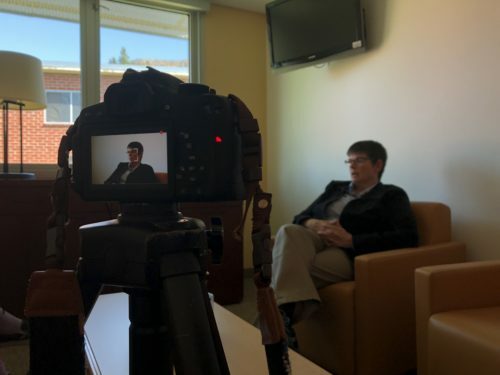 When speaking with Amy Gode, the Assistant Director of Cal Poly’s DRC, she explained how some individuals don’t use their disability to define themselves, while others consider it a huge part of their identity. After talking with Jake in our interview, we were able to take his lead on the use of specific jargon (disability, quadriplegic, person in a wheelchair) he used. Resources like “Choosing Words for Talking About Disability” were also helpful in navigating these more sensitive topics. “I was really impressed with how willing Jake was to talk about his injury. If it were me in his position, I’d probably be upset about the whole thing. But Jake carries himself really well and is such a nice guy,” said Greg after interviewing Jake on Sunday. Jake showing us his wheelie. At the beginning of this class we originally wanted to do a story about students in wheel chairs at Cal Poly. We had sources willing to do interviews and it seemed like the perfect topic. However, we ran into complications with this topic and decided to choose a different route. We still wanted to discuss disability on campus, but we now were trying to focus on students making a positive impact for those who have a physical disability rather than focusing on their struggle. The Quality of Life Plus National Program is a program designed to help wounded veterans get prosthetics in oder to improve their quality of life. 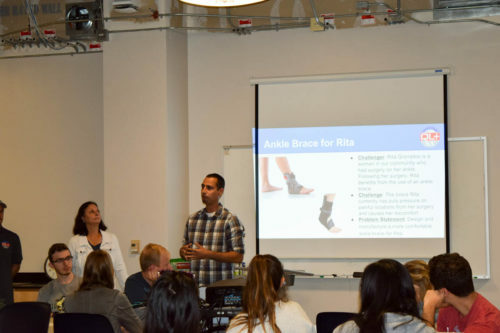 The program expanded to form a satellite club at Cal Poly, the QL+ lab, where students help those who are searching for a solution to a physical challenge. 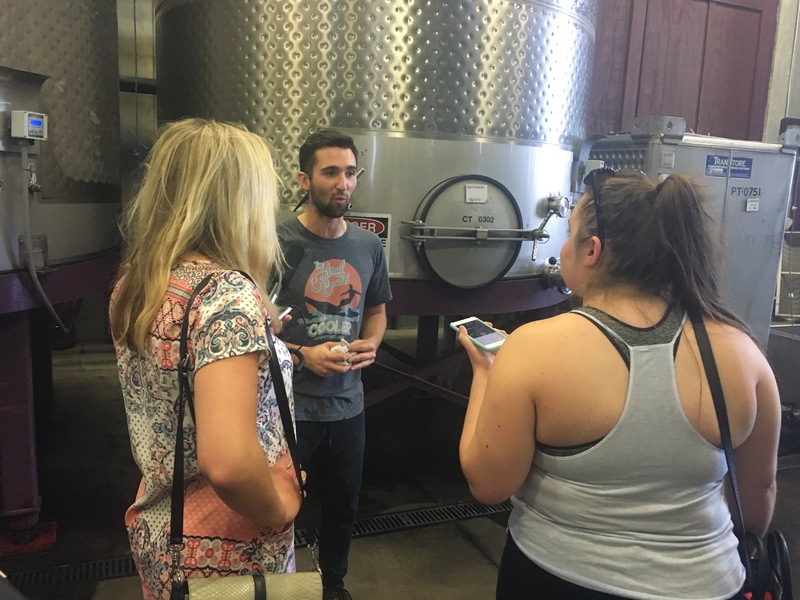 We went to their website and read a small article about a man named Chris Bratcher, a winemaker who lost his arm during a winemaking accident. 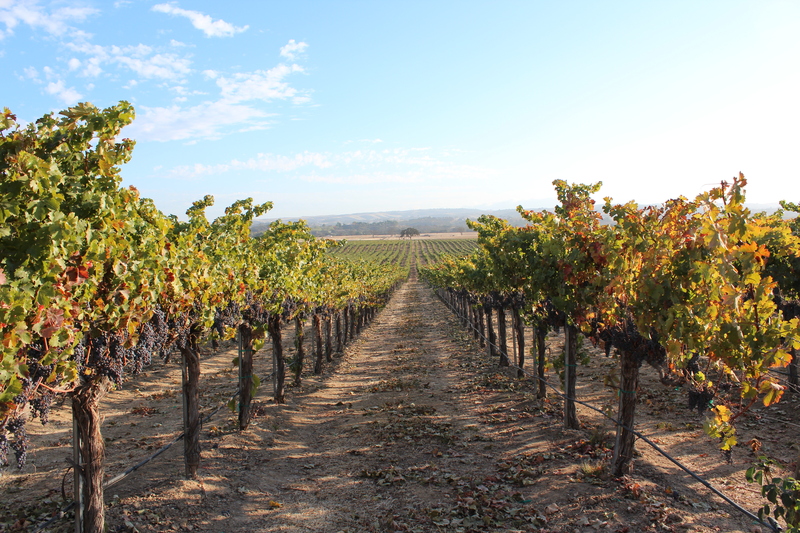 The QL+ lab was helping Chris by building him an arm so he could continue his passion of winemaking with ease. We were immediately drawn to this topic as we all connected with it in our own personal ways. Our team of journalists met with QL+ President Berkeley Davis who told us about the team of students who had been working on Dr. Bratcher’s arm for nearly nine months. She invited us to their club meeting the next night. At the meeting, we watched tentatively as a large number of engineers gathered to hear what new projects they will be working on this quarter. After their announcements, the engineers broke off into groups to do product design and brainstorm. Jordan Hanna, the videographer, set up her camera as the sun started to set behind Engineering West. Berkeley Davis agreed to do a preliminary interview before we met with the project team. The setting sun allowed for optimal light to illuminate Berkeley’s profile. As the camera beeped, notifying us that it was almost out of battery, we made sure to make every last moment of light count before the sun set. The following day we met with Chris Bratcher’s project team in the QL+ lab (which is usually off limits to those who aren’t officially in the club). Aaliyah Ramos, third year mechanical engineering major, and the rest of her team agreed to meet with us. “Our goal is to make Chris’s life easier by giving him a hand that actually fits him and that he can actually use. He will even have a sort-of opposable thumb,” Ramos said. It was here that Hanna and Isle Longoria, the interactive journalist for this story, did the majority of their filming and photography. They showed us the hand that they had been spending the past 9 months to create. We all stood in awe as we gazed over this beautiful piece of machinery that students our age had created. We each wanted to put our hearts into this project because the people we met at the QL+ lab are doing such inspiring things that we hoped to emulate their success. “The most challenging part of this project was grabbing and producing good content in two week,” Longoria said. Although this project had its ups and downs, we found that it was super rewarding to work with such great people. After completion of this project we all have a newfound respect and love for the QL+ Lab and all that they do. 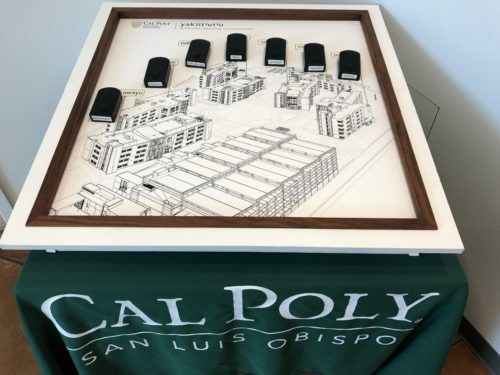 Cal Poly students are currently waiting in anticipation for the reveal of the new housing complex, scheduled for completion in Fall 2018. While students wait for the construction fencing to be taken down and for the last touches of paint to be added, there is an exciting story unfolding in the present, not just in the future during the grand opening. The new dorms currently under construction are to be named after the Northern Chumash tribe. By naming the dorms after the Chumash, the intent is to honor the native lands upon which the dorms are being constructed and instill respect for the historical culture among the new Freshman class. Although the dorms are scheduled for completion this Fall, there is still important work to be done. 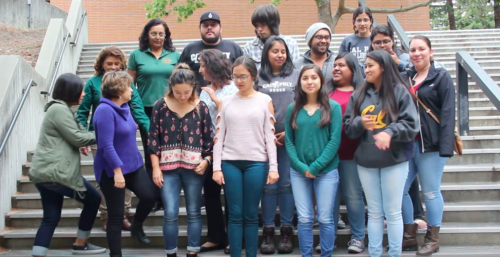 Communicating both the importance and meaning of the Chumash language to a Freshman class of 1,475 thousand students is no easy undertaking, and the Cal Poly team involved in the housing project have strategic work. 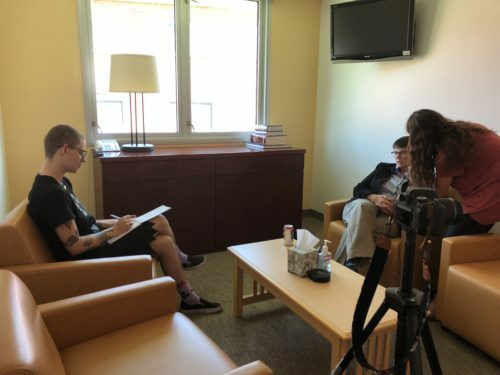 Our team of student journalists at Mustang News met with Executive Director of University Housing, Jo Campbell, to learn about her team’s behind-the-scenes efforts being made towards the creation of the new dorms honoring the Chumash. Nestled in between the South Mountain Residence Halls, sits Campbell’s headquarters at the University Housing office. Upon walking inside, there was an interactive exhibit featuring the yakʔityutyu residential community. A three dimensional model depicts the dorm layout, with sound machines attached to each building that play the pronunciation of each dorm name when pushed. The visual sound board sparked some inspiration for our Interactive lead, Navid Golemohammadi. “One of the best ways to show how the new housing project is going to affect campus is through visually displaying how the change will shape the future student body’s perception of the native names given to each new dorm,” said Golemohammadi. After experimenting with the sound board, we began our interview with Jo Campbell. Our audio/visual lead Mandie Geller set up mic equipment and her tripod, then the camera started rolling. 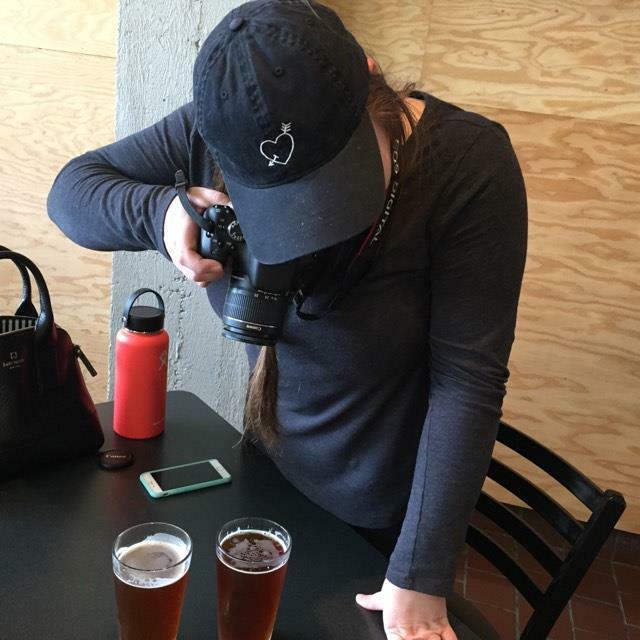 “As the videographer, it was helpful to have planned out the interview questions in advance, so that during the interview I knew whether to make a tighter shot or wide angle shot in anticipation of their response to those questions,” Geller explained. To Geller’s surprise, her camera flashed a “low battery” symbol halfway through the interview. We listened even more attentively, hanging onto Campbell’s every word in case the camera died. It was at this point that we learned perhaps the most interesting fact of the interview. 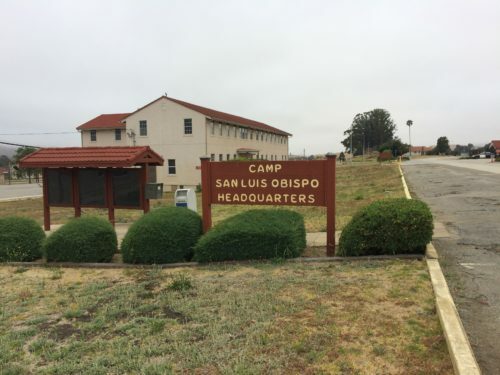 Campbell revealed that prior to the construction of the new dorms, the Chumash language had never been written down before, it was only passed down orally. From linguists to education outreach, there is so much more depth to preparing the new residence halls than only construction. After the team’s interview process, we felt even more passionate about the project and amazed by the richness of the Chumash culture. Our story idea started out with the recent news of Grover Beach approving marijuana businesses to open. 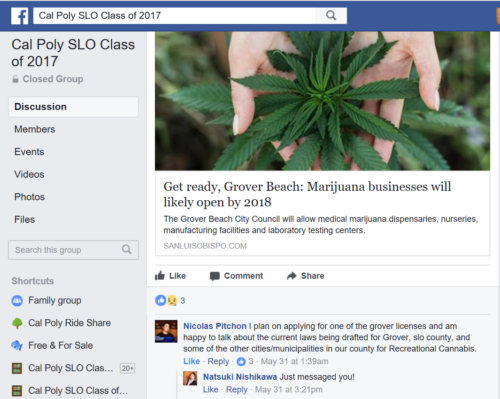 After I posted about the topic on the Cal Poly SLO Class of 2017 Facebook page, I received a comment from Nicolas Pitchon, a Cal Poly student who runs his own marijuana delivery business. Pitchon’s comment on my post on the Cal Poly SLO Class 2017 page on Facebook. “I plan on applying for one of the Grover licenses and am happy to talk about the current laws being drafted for Grover, SLO county, and some of the other cities/municipalities in our county for Recreational Cannabis,” Pitchon wrote. Pitchon in his backyard of his home in Avila Beach. 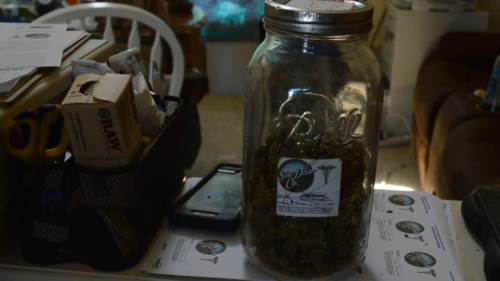 So I scheduled a interview with Pitchon at his home in Avila Beach, where he also uses as his workplace for his marijuana delivery business, Slo Dro Co. Along with his delivery business, Pitchon also operates two farms and is the secretary for the SLO NORML (National Organization for the Reform of Marijuana Laws), which is a non-profit organization whose aim is to move public opinion sufficiently to achieve the legalization of non-medical marijuana so that the responsible use of cannabis by adults is no longer subject to penalty. Jar of marijuana with the business lable, Slo Dro Co. I am not very familiar with marijuana, but right when I stepped into his home, I was hit with a very strong smell of marijuana. There were also a ton of actual marijuana all over his home. Pitchon told us how he is planning to apply to one of the two Grover Beach marijuana business license, and even let us film him smoking. Hannah Landry, broadcast, filming Pitchon smoking. It was great that we got to see the behind the scenes on how he ran his delivery service and since his home is also the office for the business, there was so much material for us to film and take photos. That was when we decided to change our story to a feature story about Pitchon, and tying in the story of Grover Beach’s approval of marijuana businesses. I think I was really lucky to find Pitchon and interview him since it definitely made our story much more exciting than just talking about Grover Beach. 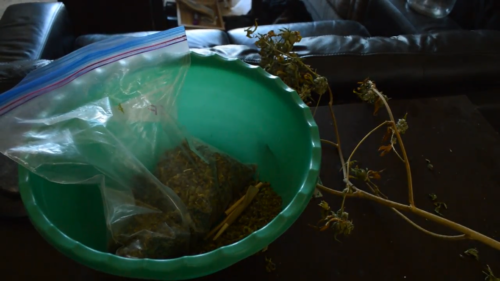 Bowl of marijuana in Pitchons home. “It’s interesting to see how the community handles such a difference in their town compared to others in the area with regard to having marijuana businesses. The area seems a little bit older, more retirement age, and the acceptance of this by City Council and the Planning Commission as well as citizens of the city show that they are a progressive area open to change. It’ll be interesting to see in the coming months what happens when businesses can apply for permits to be one of the two stores selling marijuana in Grover.” -Ayrton Ostly, multimedia. Our group setting up the equipment to shoot the interview. “The story was fun to write because we went into it knowing very little details about the subject, and after just one interview we had already learned so much! 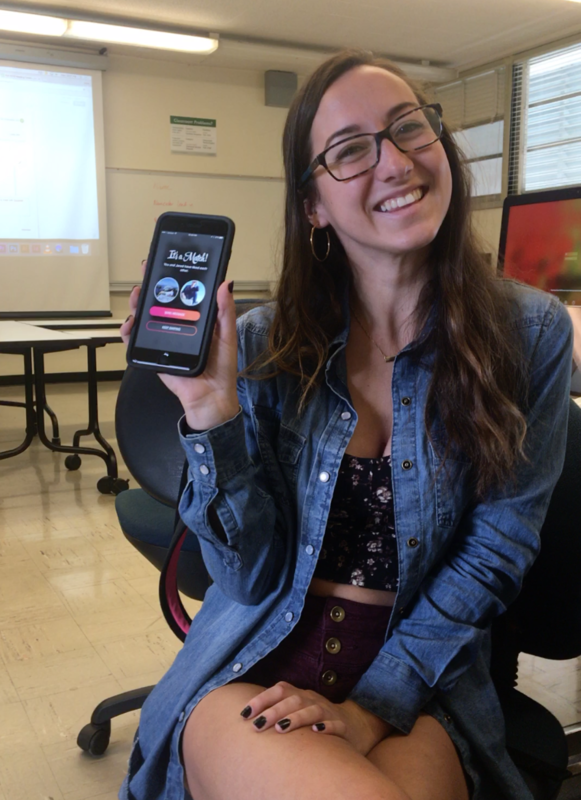 I think this was our best story of the quarter, so I had a great time writing it.” -Kameren Mikkelsen, Print. I’ve never been more excited about a class than I was about my ethnic studies course, Beyonce: Feminism, Race and Politics. The more and more I bragged about it to my friends I quickly realized that the majority of people either had no idea this class existed or, didn’t understand the relevance of the coursework. Being in senior project we’re supposed to pitch newsworthy topics and I thought how perfect this would be for a story. Initially I pitched the idea of writing about “Bey Day”, this was my ethnic studies class final, which was a day dedicated to performances celebrating Beyonce and student/faculty panel discussions of black feminist authors. Brady was all for it, then quickly realized that Mustang News would be covering this event as it needed a more timely coverage. As I continued to try to fight for covering this story, bragging about my professor, Dr. Navarro, listing off her accomplishments and trying to prove that she was unique enough for this story, Brady stopped me and said, “why don’t you do a feature on her instead?” I was surprised because I honestly assumed that Mustang News had written about her before, but after checking the archives I was delighted to move forward on shedding the spotlight on one of my favorite professors. 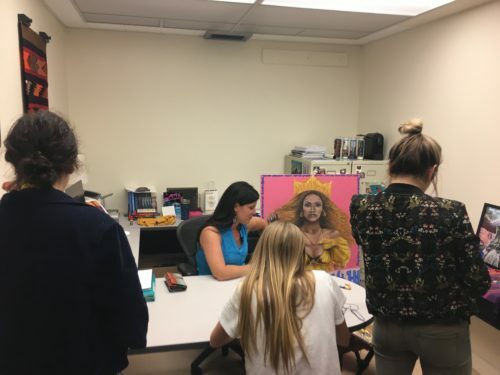 Dr. Navarro, and her hype woman Bey in Navarro’s office. I wasn’t disappointed, so I wanted the readers to understand where this sentiment was coming from. What kind of struggles did you face bringing the Beyonce course on campus? What are some of your professional, academic and personal goals? What are some of your proudest moments as a professor? Annie Vainshtein, was handling multimedia this project. I suggested that her Thinglink hotspots should include interviews with: former students, her partner and fellow colleague Dr. Navarro, and her department chair Dr. Isom. That way readers could get a glimpse of Dr. Navarro through different perspectives. For her second component, I suggested a Storify, so that we could compile all of her published works and publicized events so that the reader could learn more about her credibility and some background to her academic and professional carer. Lauren Roberge’s portion was broadcast, so she joined, Annie and Nicole and I for Dr. Navarro’s interview to film her video, “I really enjoyed getting to know Dr. Navarro and what she stands for. It’s inspiring to see someone work as hard as she does to make a difference in the issues surrounding racial injustice on campus and at home” she said. Annie, Nicole and Lauren watching Navarro take out her small wooden chest of beads. We wrapped up the interview with a few portrait shots and then Dr. Navarro finally went. Nicole and I stayed after chatting about the incredible quotes she gave us brainstorming what we should lead with when Peterson said, “just from meeting Dr. Navarro I can tell what a great person she is, I really wish I had met her sooner in my Cal Poly career”. As previously mentioned in this blog post written by my fellow teammate Lexy Solomon, working on this story was a challenging for a few reasons— a lot of the conversations were sensitive and we had to be mindful in our approach, and organizing over 20 interviews with students and faculty is tedious work. However, this story allowed our team to take part in conversations about extremely important topics on this campus. Through our interviews and interactions with staff and faculty, we very quickly learned how important this story was for Cal Poly’s campus. Nearly every person we reached out to was grateful that we were covering their individual cultural ceremonies since that hasn’t been done before. 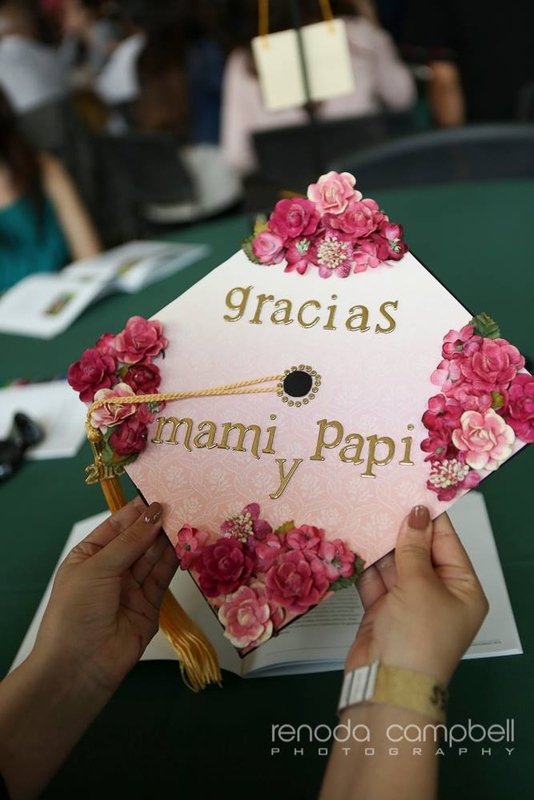 At the Chicano and Latino Commencement meeting, Lexy and I gathered stories from students about how their culture has impacted their Cal Poly experience, and the responses were heartwarming. Psychology Senior Yvette Solano comes from a small, predominantly Hispanic town in San Diego, and coming to Cal Poly her Freshman year was a major shock. 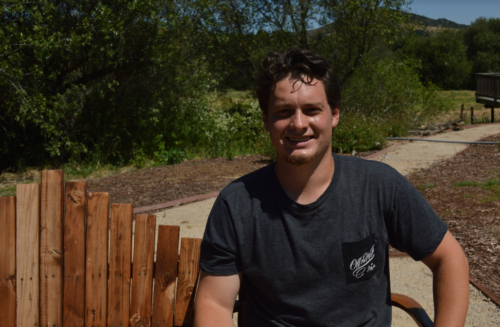 Many students including Solano told stories about how their families supported them through their time at Cal Poly, and how much the cultural ceremony means to them. During my interview with Ethnic Studies Assistant Professor Jenell Navarro, the topic of funding came up. She said that although the university supplies a certain amount of money for the event, the budget isn’t big enough to include every aspect of the ceremony. According to Navarro, the American Indian and Indigenous Commencement ceremony received additional funding from the American Indian Faculty Staff Association and Career Services. 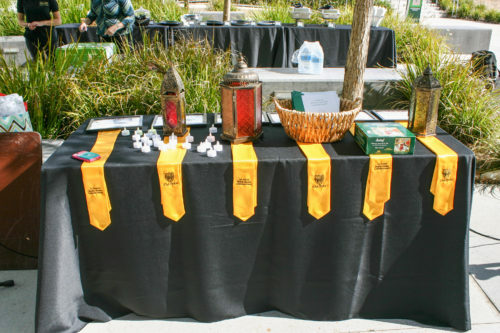 In addition, University Housing paid for the graduates’ blankets for the ceremony to represent the students and their families, as well as commemorate the Chumash naming of the new Student Housing South. 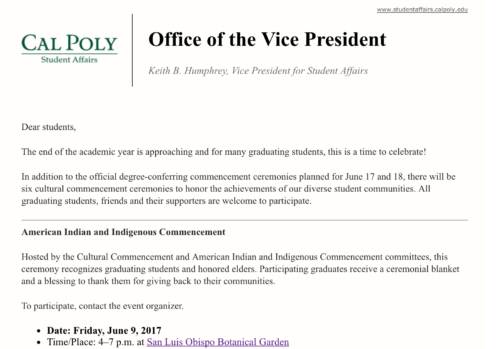 This was the first year that Student Affairs sent an email about the Cultural Commencement ceremonies to every student. This makes us hopeful that the campus will continue to pursue equal representation for marginalized groups on campus. 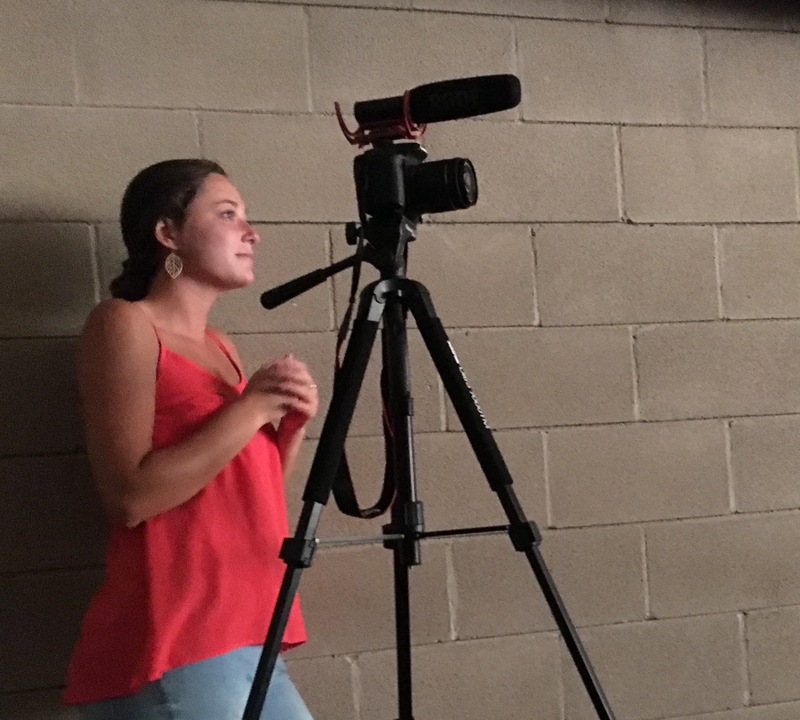 After working on this project for weeks and getting to hear stories from students and commencement coordinators, we hope that this inspired student media to cover different cultural groups more often. Before starting this story, I knew next to nothing about the ROTC program. Over the last four years, I’d seen some students in uniform walking around campus but was honestly too intimidated by the outfits to look for very long much less ask them any questions. I now realize how foolish I’ve been. 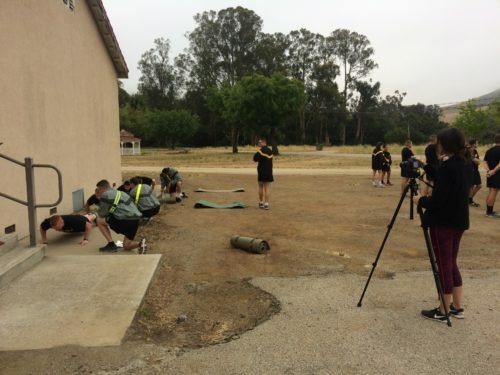 At the start of this quarter, one of my other group members pitched the idea of doing a story on Cal Poly’s ROTC program or maybe profiling a specific student. There hadn’t been any major stories on the program in the last few years. As our luck would have it, a Mustang News writer had been working on a profile piece around the same time we were looking to do our story. My group is short a member so we always have one element of the usual senior project missing. This time around, we were able to use Emma Kumagawa’s story and add in our multimedia elements. For me, having Emma was extremely because she had already made some contacts with members of ROTC. 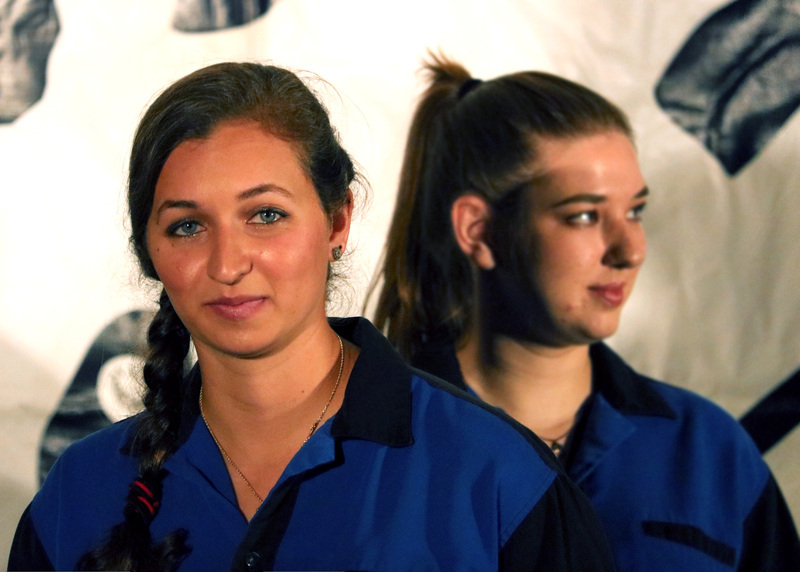 Her story was focused on ROTC Senior Cadet and biological sciences senior Katherine Holst, who’s headed to the 82nd Airborne to serve as a field artillery officer for at least the next five years. When I first starting talking to Katherine, I was intimidated. I didn’t know much, but I could tell she was a person of great importance. When other students and even higher ups passed by us, their behavior suggested she was certainly a woman with authority. While she maintained this general vibe during our entire time together, I soon realized that she’s really no different than me. She’s just a student trying to make it through. I certainly don’t mean that as a negative, but I was under the impression that everyone is ROTC cadet was some gym rat with an aggression problem. Again, I quickly realized I was wrong. My group members agreed. 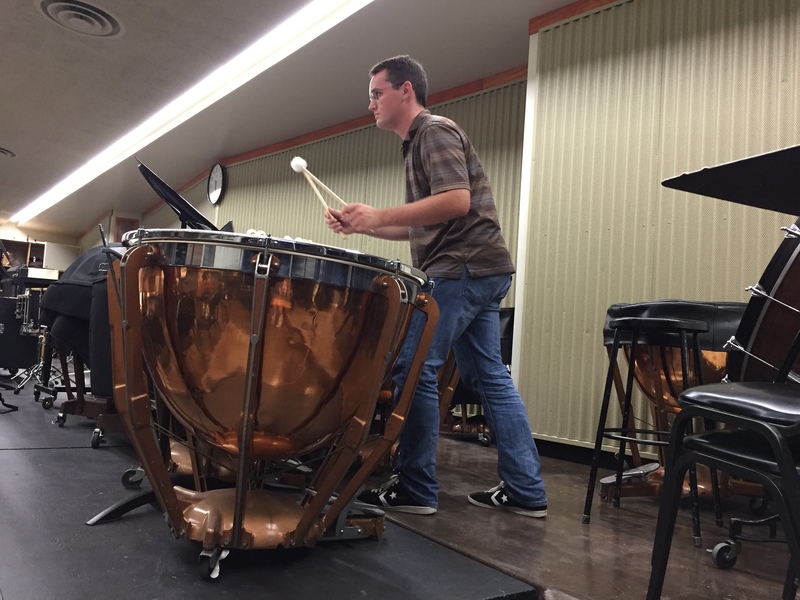 “I really liked working on this story because through all of the tough workouts and time commitments, these students are just like any other students but they happen to play a part in the bigger picture of life. It’s awesome to see they are not all that different,” said Jessi Armstrong. Katherine understood that this was a common misconception for people who aren’t familiar with the program and that she gets more than her fair share of flack simply for being a woman within the unit. “There is nothing magical about being an ROTC cadet. We aren’t a bunch of geniuses of fitness freaks or anything else out of the ordinary. We are simply a group of students who have decided to join something a little bigger. So don’t feel like ROTC is reserved for a select or tiny elite subset of the population. Feel free to come to Dexter and check us out, come chat with us or come do PT with us if you feel like it. I think you’ll find it’s not as different or as scary as it first seems,” said Holst. My group and I actually ended up joining Katherine at 6:30 am one Wednesday morning as she headed out to Camp SLO, a local military base. There were some juniors taking their physical fitness test and we were able to see how the whole thing went down. And for a third time, I saw how my own preconceived notions had dictated my perception of these people. There were students of all shapes and sizes, each with their own unique story of why they joined ROTC. No two were alike other than that they were all extremely friendly and welcoming to us. They were focused when they needed to be but during breaks, they laughed and joked around like any other typical college student. 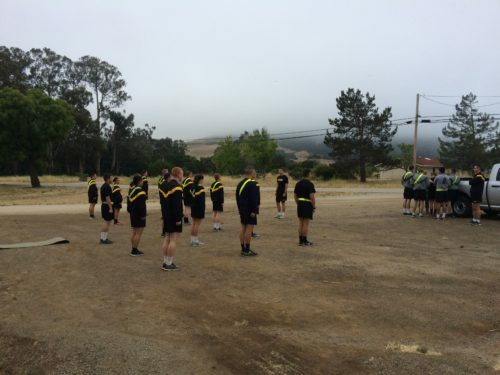 “I found that the people in ROTC are really motivated and dedicated. Waking up at 6 am to go workout three times a week is brutal and I admire them so much for putting so much time and effort into something they are passionate about,” said Marie Leleu. In just one short week, soon-to-be Cal Poly graduates will be lined up along the edge of Spanos Stadium with their fellow peers, proudly sporting green caps and gowns, receiving diplomas, and officially becoming Cal Poly alumni. However, this won’t be the first celebratory ceremony some students will be participating in. 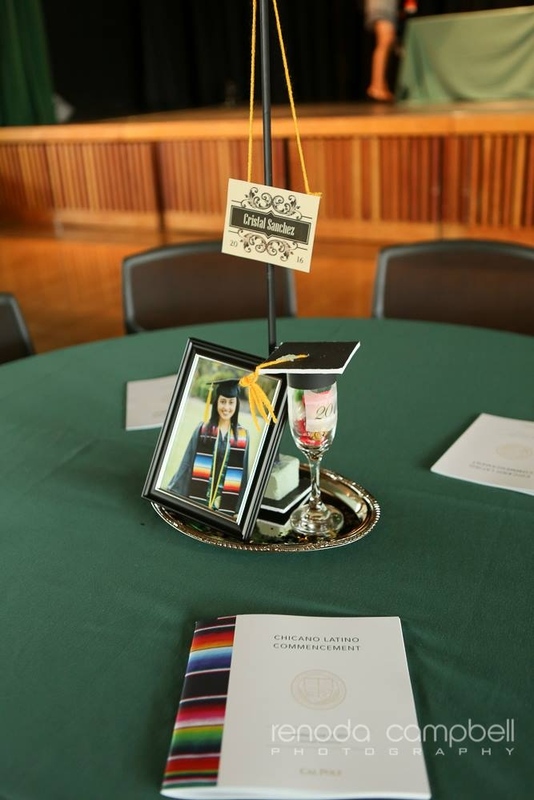 Several students will have already participated in an intimate cultural commencement ceremony amongst their families, that aims to honor and recognize the accomplishments and hard work of each student. Last month, Harvard’s first black commencement ceremony made headlines as students banded together to create their own ceremony to celebrate the achievements of black students and faculty, which they believe are overlooked. 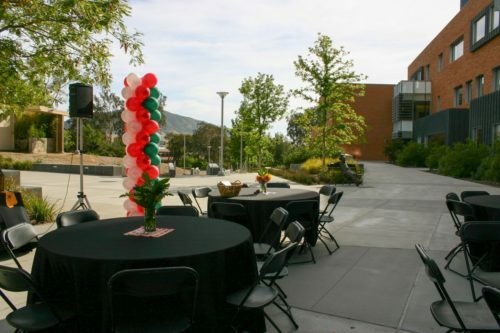 As this story began to spread across the nation, my group and I set out to learn more about the six different cultural commencement ceremonies Cal Poly offers. A closer look at the set-up of the Middle Eastern student commencement ceremony. Photo courtesy of Raha Haghnia. Middle Eastern Commencement Ceremony stoles for the class of 2016. Photo courtesy of Raha Haghnia. My team and I definitely encountered some obstacles along the way. Reporting on this topic was not smooth sailing as we anticipated. While we went into this story with nothing but good intentions, one of the cultural groups did not appreciate us attempting to better understand their culture, but rather, they were highly offended and were not receptive to working with journalists or other students. Although we tried to make amends and continue the relationship, they were firm on their decision to not contribute to our story. It is unfortunate because we wanted to include them in our story and highlight the students’ accomplishments, but were unable to do so. “This has been a very challenging story to work on, but focusing on underrepresented groups on campus is extremely important. We had to organize so many interviews and meetings, and might have rubbed a certain group the wrong way, but this has been a learning experience and I have enjoyed hearing all the different stories and experiences” Cameron Bones said. Group of students who are participating in the upcoming Chicano/Latino commencement ceremony gather to take a photo with advisors who helped plan the ceremony. Photo courtesy of Cameron Bones. 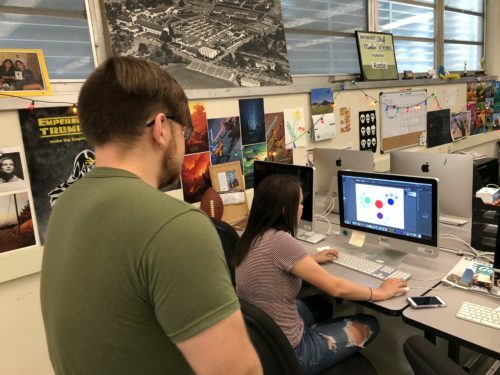 Although there were more bumps than anticipated with this story, it is the last story of our journalism career at Cal Poly, and despite the frustration, countless hours spent seeking out sources, and weeks of dedication poured into this story, I think we successfully captured what we aimed to do. “It was a pleasure to speak to the cultural commencement coordinators and students who are participating. Speaking for myself and my teammates, we appreciate each and every person who has shared their stories with us” Victoria Howland said.